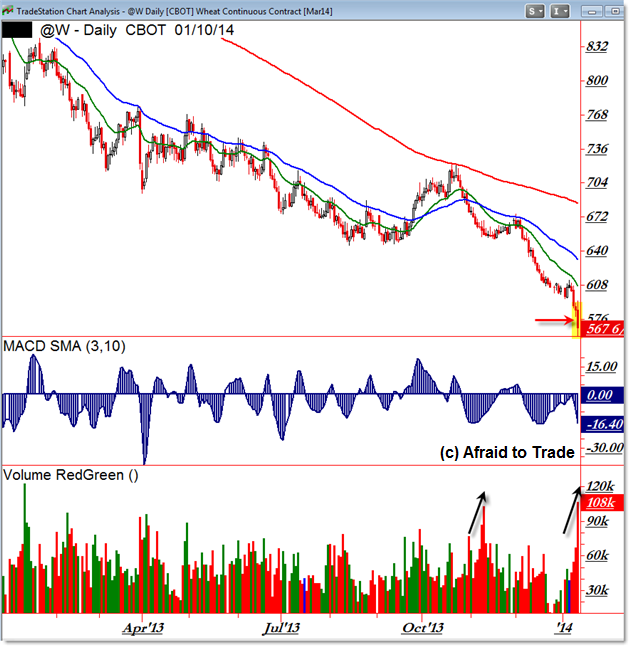 Recent price activity in Corn, Oat, and Wheat provide evidence of this concept, and even if you don’t trade these markets, it’s a good idea to take a look at the recent “violent” price action in the context of ongoing major trends in these commodity markets. The main idea from these three charts is to study the prevailing trend structure (compare highs and lows) and note the recent price action. Particularly in commodity markets, trends tend to be salient (lasting) events which give traders opportunities to join the trends on pullbacks (retracements) or breakouts (as was the case in Oats recently). We compare price with a momentum oscillator along with volume (paying close attention to strength or divergences with price and the indicators). Pay close attention to the mini-divergence and reversal examples I highlighted in Oats (@O). With the trend structure established, let’s now turn our attention to today’s ‘violent’ or volatile one-day moves that draw our attention. 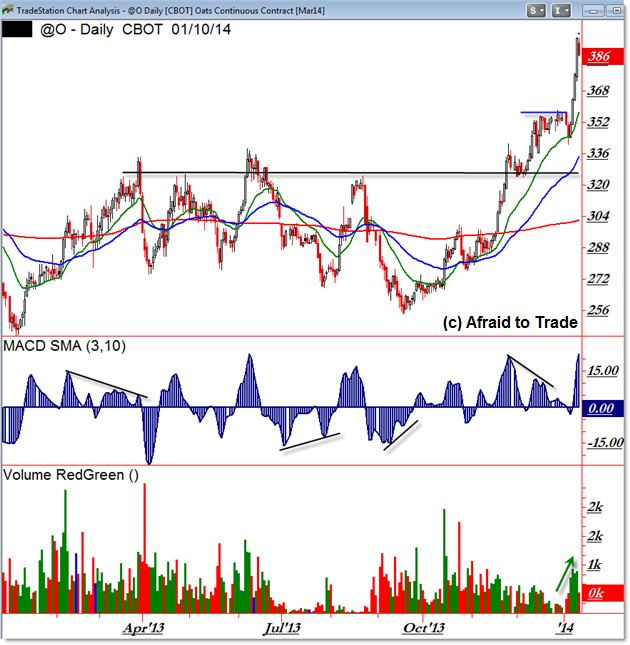 Wheat continued the trend (failed reversal) with a power-sell day; Corn fought the trend with a big upside session; and Oats took a well-deserved pause after a stellar three-day impulse from a breakout. Taken together, we can see how the intraday power-buy (or sell) impulses fall within the broader picture of the three Daily Chart trends. 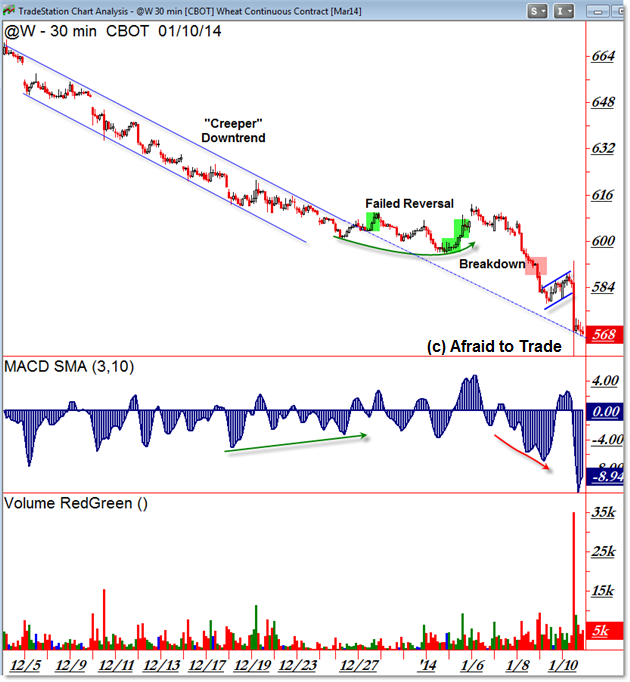 For Wheat (@W), price continued to fall or “collapse” after a failed bullish intraday reversal. 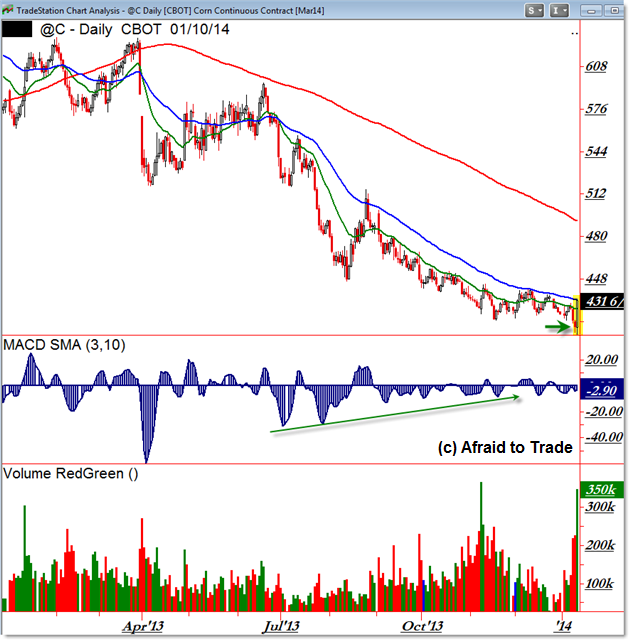 The big surprise – and powerful impulse up via a short-squeeze – took place in Corn (@C) after a trendline breakdown into “Bear Trap” scenario unfolded. Price rocketed from the lower trendline all the way to a new breakout above a falling trendline structure. 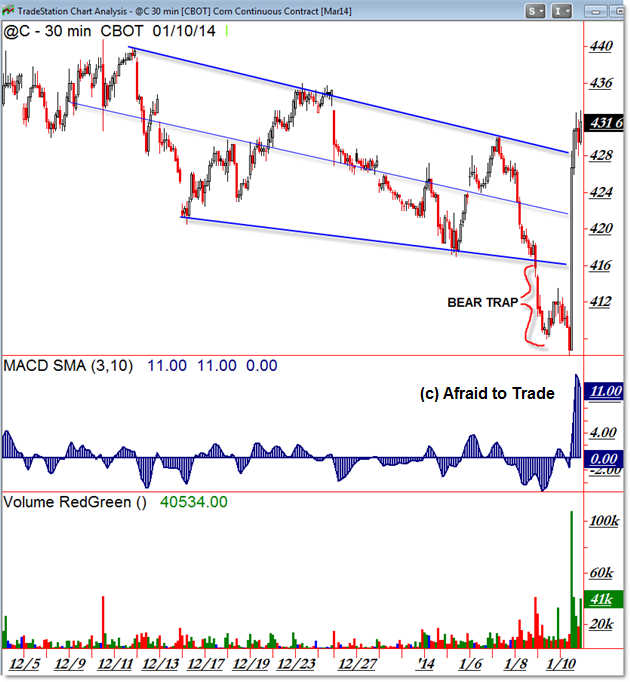 Continue watching Corn relative to these intraday trendline barriers. 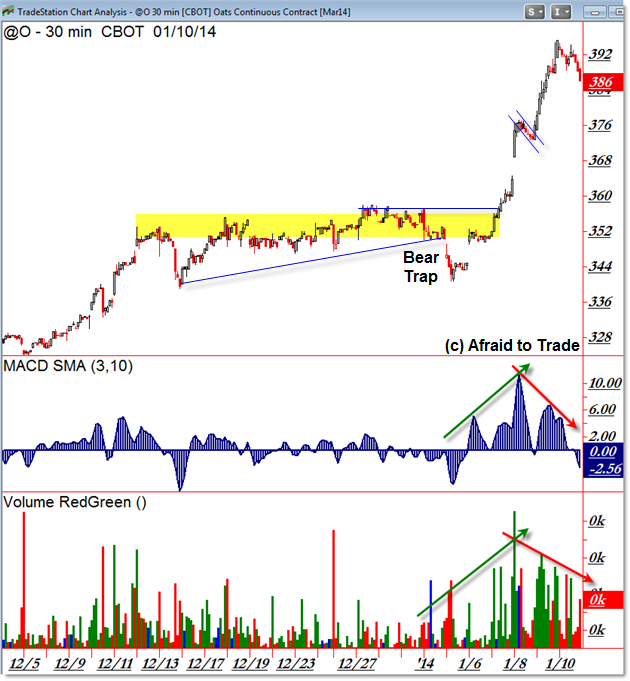 Finally, Oats (@O) reversed lower down away from 392 on a dual negative divergence development (momentum and volume). I highlighted the sideways consolidation range along with the recent Bear Trap which was slightly smaller in scope than Corn’s recent trap. Corey Rosenbloom, CMT is the founder of www.afraidtotrade.com, a website dedicated to helping traders overcome fears through education. He received a dual-baccalaureate degree in Psychology (Cognitive) and Political Science and a Master’s Degree in Public Affairs with a concentration in Business. In 2009, he was awarded the Chartered Market Technician (CMT) professional designation. He began investing using fundamental analysis in 1998 during the run-up to the market top in 2000, and the ensuing bear market opened his awareness to the field of technical analysis as a way to enhance performance and manage risk more effectively. Having also incorporated sector rotation and intermarket analysis into his investment and tradingstrategy, Mr. Rosenbloom switched to shorter time frame trading tactics to capture additional edge from the price action and trends. He began writing the AfraidtoTrade.com blog to share some of his experiences and define strategies, which detail his unique style of incorporating both the larger perspective of intermarket analysis with the shorter, intraday trading strategies that can be employed to minimize risk. In addition to classic price and momentum principles, Corey incorporates basic Elliott Wave and advanced Fibonacci techniques as well as his insights into trading psychology and edge-optimization tactics through daily commentary, education, seminars, and research in the field of technical analysis.